Damien and Nyinkalya's paintings act as a teaching tool and illustrate families in their traditional country, where the environment is lush and a there is a hive of activity. 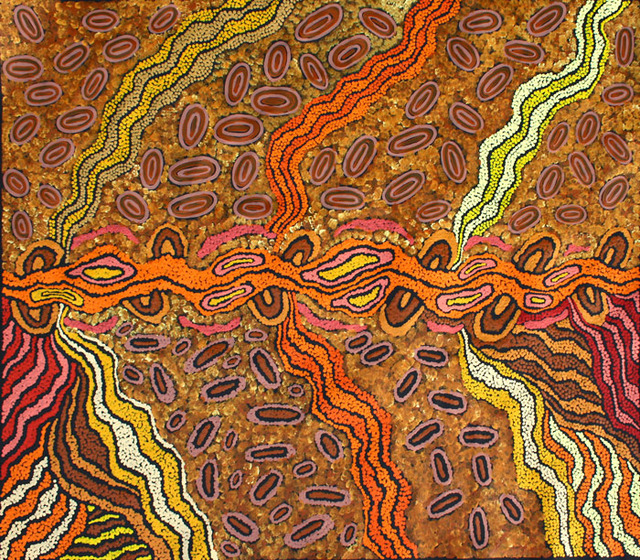 The country in this painting is Kintore, west of Mount Leibig in the Northern Territory. It shows people travelling thorough the country , moving from rockhole to rockhole, following the water. The round patterns in this work are camel tracks. Tinkari is a place from Damien's father's country, which is a Pintupi area, West of Mount Leibig, not far from Kintore. Damien's father and great great grandfather would travel around Tinkari camping in different places.